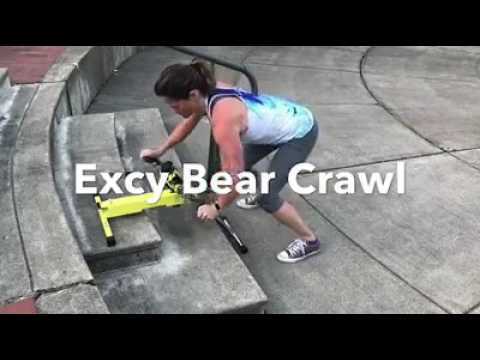 Excy is an amazing lower and upper body exerciser that is unmatched in quality, versatility, and ruggedness and today’s bear crawl move captures one of our more difficult positions. In the bear crawl, you can use Excy to create an amazing low impact upper body circuit to build strength and muscular endurance in your chest, triceps and shoulders, but also fully engage your core and your legs. Each rotation will test your coordination, stamina, and strength in new ways—but you can expect a burn in your abs, shoulders, and quads the entire time. Throw in some crab walks and you will really engage your core. With the widest resistance ranging from lightweight (2 pounds) to heavy (70 pounds), Excy is easy to operate when you are just starting out, but then also crank up the intensity as you progress in your training. Resistance is smooth and bi-directional, so make sure to crank forwards and backwards to work opposing muscle groups. Start with easy resistance. There are so many ways to use Excy as an upper body exerciser, whether as an upper body ergometer on the table, an upper body restorator on the floor, or a full body ergometer whenever and wherever you want. The bear crawl position can be done with stairs or on the floor. On the floor, consider adding the Excy Keeper so that the Excy system does not scoot. Explore the Excy mobile coaching application to set intervals and track your results. Most of all, have fun! Excy can also turn any chair into a recumbent exercise bike and unicycle for standing cycling workouts.